I think he has access to a state that far exceeds ours. That doesn’t make it a categorically different state that he’s achieving. It just means that he is able to touch something and to see a vast landscape where we only get a sliver of that experience. Jeremy Shaw’s artistic practice is characterized by a complex use of effects and narrative devices in relation to perceptions of reality and expressions of ideology in contemporary art, film and popular media. 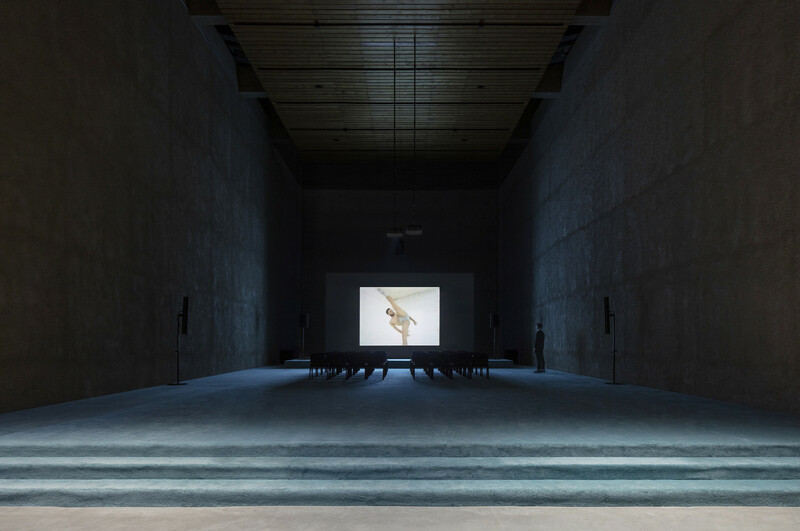 His most recent film, I Can See Forever (2018), is the final chapter of the critically-acclaimed and widely exhibited Quantification Trilogy, preceded by Quickeners (2014), and Liminals (2017). All three films explore the potential of catharsis to simultaneously represent and effect states of mind, perception, ecstasy, belief, religious fervour, escapist fantasies, and extremes of subjective experience as formulated in sub- and counter-cultures that have changed the Western political landscape since the 1960’s. Through a precise management of the expectations of film, Shaw’s works directly challenge normative forms of subjectivity in cultural production. I Can See Forever is a pseudo-documentary set approximately 40 years in the future. It is presented as an episode of a documentary television series about “The Singularity Project”– a failed government experiment that aimed to create a harmonious synthesis of human and machine. The film exposes the story of the only known survivor, 27 year-old Roderick Dale. Born with an 8.7% Machine DNA biology and uninterested in the virtual reality-trappings of his time, Dale has committed himself to a life immersed in dance. 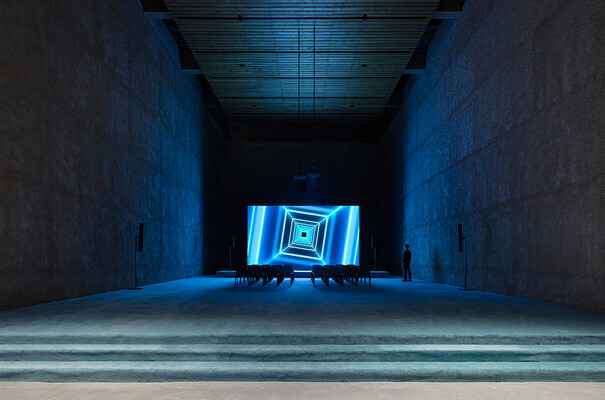 During his unique, virtuosic activities, he claims to be able to “See Forever” – a multi-layered and contentious term that he defines as the ability to transcend to a digital plane of total unity while maintaining a corporeal physical presence. His rather hermetic life is devoted to studying ballet, modern, and various subcultural styles of dance on television. Candid scenes of a solitary Dale traversing empty civic spaces confirm the fact that ordinary denizens prefer to privately absorb themselves in The Unit – an advanced virtual reality device that has replaced spiritual experience in humans. Dale’s story unfolds in the style of cinéma vérité through interviews, archival materials and testimonies of characters that are the subjects of an exposé, while voice-over narration outlines a troubling future world that is an exaggeration of competing myths and promises surrounding technology today. Shaw manipulates narrative and visual expectations to such a degree that one faces a suspension of belief and disbelief. The futuristic biotechnologies and spiritual transcendence-replicating virtual reality machines described in the story stand in contrast to jigsaw puzzles and dance programs viewed on a cathode-ray television set, unless, of course, one accepts that the problem of class is not solved by technological progress. The film’s overall period-piece styling and aesthetic – coupled with the familiar quality of grainy videotape interrupted by tracking – could, for some viewers, provoke a nostalgia for the 90s, the decade globalization secretly and radically transforms private and public sectors worldwide. Futurity casts shadows on the recent past. The use of outmoded media to trigger nostalgia underscores the fact that belief itself has a temporality. Is it by an ongoing, historical conceit that the facticity of historical documents seem naïve compared to those produced by contemporary means? While a viewer is making sense of the material, the film presents us with a threatening situation: what if we, as citizens of the 21st Century, have lost spirituality? How would we know – would it be gone forever? What good are facts if the plot is lost on an overall sense of purpose? Dr. Daniel Moore’s testimony, cited above, reveals how the Kantian sublime functions today: it is not enough to understand the secrets of nature with human eyes. Human knowledge depends on machines to experience the world and produce signs that are interpreted by scientists. But what if everyday experience extended the human senses into the effects of the universe around us? What if we didn’t have to turn back at the limits of our understanding? Would we lose the intimacy that engulfs us in the absence of a concept to explain what we are touching? Would we lose our humility? Or empathy? Our sense of an outside and of belonging? If history is told in the present, the present of Shaw’s films extend on either side of the contested moment we live in. During a highly anticipated, extended dance scene of Dale in his studio, the yearning for corporeal expression becomes unbearably beautiful. The spectrum of sound slowly begins to expand from stereo through to surround and the pace of montage accelerates. The practice session becomes one of the greatest performances (as is so often the case) and feels like the climax of the film. The viewer is sonically engulfed for a spell of time, until, suddenly, images of Dale begin to dissolve into overwhelming, computer-generated effects developed by Shaw to illustrate an extreme, subjective experience. The protagonist appears to transcend dance at the very point of becoming the object of a filmic exploration. Transcendence through dance shifts in character to become a struggle against representability. This second climax of the film is destructive: the whole aesthetic, context and presentation of the story are exploded and transformed. In the end, the artwork reframes the story of Dale’s life, devouring and incorporating his being (and why not the viewer’s as well?) into its own apparatus. This rupture and incorporation is deeply ambivalent: for some it could represent faith, pleasure and freedom, for others, delusion, suffering and tyranny. Is all this just business us usual? Throughout his artistic practice, Shaw is a keen observer of cultural phenomena that favour an experimental use of the mind and the body to challenge the normativity of mainstream culture. His work compels a dramatic tension around claims of truth or bodily transcendence that are entangled in self-styling forms of communal life found in cults, religious groups, scientific communities, utopian drug scenes, music and dance subcultures etc. This tension – for some viewers maybe even anxiety – expands itself to expectations around the power, or effectiveness, of contemporary art itself. Reality is an entanglement of the effects created by human ingenuity with the potential risk of losing humanity itself. Consistent with his previous work, I Can See Forever outlines a politics of the creation and economy of effects and affects, realities and emotions that raise issues around identity, belief systems, human evolution, and altered states that coalesce around the limitations of the human form. More specifically, the film articulates authentic experience as the point where catharsis, the sublime experience, and their representation form the site of an ethical and political battle for autonomy that one feels forcefully subjected to or offered as a promise of escape. Aesthetically and conceptually speaking, this is not the commonly tasteful politesse of Bourgeois culture promoted in contemporary art. What is at stake is a sense of belonging in the complexity of human meanings. It is significant that Dale is driven to realizing a personal sense of belonging through his enhanced biology by actively engaging processes of research and experimentation – viewers of the artwork are left to reflect on their own beliefs and methods for doing so. In this suspension of belief and disbelief, Shaw’s work is able to reveal a struggle between the search for truth and the desire to style and exhibit one’s own form of life through self-determination and expression, in opposition to dominant forms of governance and opinion-formation. I Can See Forever raises the question: is contemporary art a suitable site to stage such a struggle, or to present such a revelation? Jeremy Shaw (b. Vancouver, 1977) works in a variety of media to explore altered states and the cultural and scientific practices that aspire to map transcendental experience. His films, sculptures and installations have been exhibited extensively around the world, including solo shows at MoMA PS1 (US), Schinkel Pavillon (DE), and MOCA (CA), and been featured in group exhibitions such as the 57th Venice Biennale (IT), Manifesta 11 (CH), Stedelijk Museum (NL), and Palais de Tokyo (FR). In 2018, he was awarded a residency at the Hammer Museum (US) and was the winner of the 2016 Sobey Art Award (CA). Works by Shaw are held in numerous public collections worldwide including the Museum of Modern Art, NY, Centre Pompidou, FR and Tate Modern, UK. In 2020, Jeremy Shaw will have a solo exhibition at the Centre Pompidou (FR). 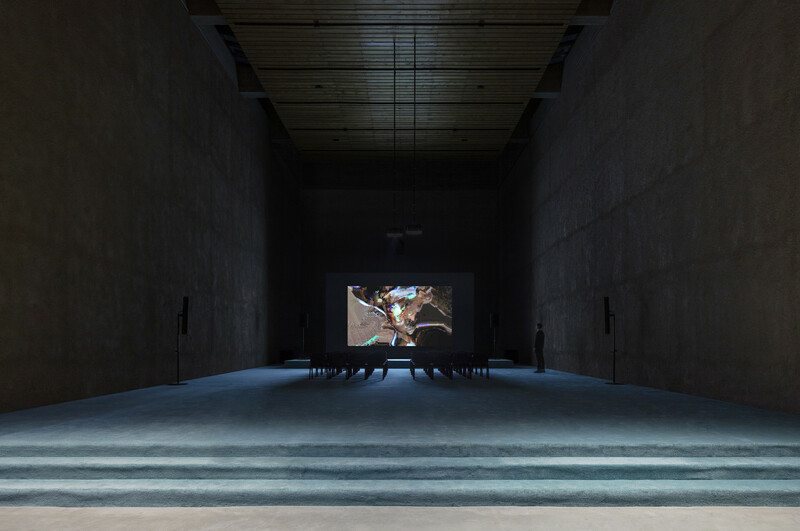 I Can See Forever was co-produced by Medienboard Berlin Brandenburg and KÖNIG GALERIE with support from the Hammer Museum, Los Angeles, Kunstverein Hamburg, and the Esker Foundation, Calgary. Ich glaube, dass er Zugang zu einem Bewusstseinszustand hat, der unseren weit überschreitet. Das bedeutet nicht, dass dieser Zustand zwangsläufig völlig andersartig sein muss, es bedeutet vielmehr, dass er in der Lage ist, dort etwas zu entdecken und weite Landschaften erkennen zu können, wo unser Sichtfeld stark eingeschränkt bleibt. Jeremy Shaws künstlerische Praxis zeichnet sich durch die Verwendung vielschichtiger Effekte und Erzähltechniken aus, die mit der Wahrnehmung von Wirklichkeit und dem Ausdruck von Ideologien in der zeitgenössischen Kunst, im Film und den Massenmedien einhergehen. Sein jüngster Film I Can See Forever (2018) ist der Abschluss der hochgelobten und vielfach ausgestellten Quantification Trilogy, die mit Quickeners (2014) gefolgt von Liminals (2017) begann. Alle drei Filme erforschen kathartische Praktiken, mit deren Hilfe Bewusstseinszustände, Empfindungen, Ekstase, Glaube, religiöse Inbrunst oder Ausbruchsfantasien dargestellt und gleichzeitig hervorgerufen werden sollen. Es sind diese Extreme subjektiver Erfahrungsräume, die ausgehend von den Sub- und Populärkulturen der 1960er Jahre auch Einzug in die westliche politische Landschaft gehalten haben. Durch ein geschicktes Spiel mit den Erwartungen, die der Betrachter an das Medium Film hat, gelingt es Shaw, mit seinen Arbeiten die normativen Formen der Subjektivität in der Kulturproduktion in Frage zu stellen. Das pseudodokumentarische I Can See Forever spielt etwa 40 Jahre in der Zukunft und ist als Episode einer fiktiven Fernsehdokumentation über das „Singularity Projekt“ angelegt – ein gescheitertes Regierungsexperiment, das auf eine harmonische Synthese von Mensch und Maschine abzielte. Der Film erzählt die Geschichte des 27-jährigen Roderick Dale, des einzig bekannten Überlebenden dieses Experiments. Geboren mit einer 8,7%igen prozentigen Maschinen-DNA und nicht interessiert an den Verlockungen der virtuellen Realität seiner Zeit, hat sich Dale ganz dem Tanz verschrieben. Während seiner einzigartigen, virtuosen Aktivität behauptet er, „für immer sehen“ zu können (See Forever) – eine vielschichtige und umstrittene Wendung, die er als die Fähigkeit definiert, sich auf eine digitale Ebene der totalen Einheit zu begeben und gleichzeitig eine körperliche Präsenz zu bewahren. Sein weitgehend hermetisch geführtes Leben hat er dem Studium des Balletts, des modernen Tanzes sowie verschiedener subkultureller Stilistiken des Tanzes im Fernsehen verschrieben. Die Momentaufnahmen, in denen Dale allein leere urbane Orte durchquert, zeugen davon, dass die gewöhnlichen Bewohner sich lieber privat in „The Unit“ verlieren, einem hochentwickelten Virtual Reality-Gerät, das die spirituelle Erfahrung von Menschen ersetzt hat. Dales Geschichte wird im Stil des Cinéma vérité unter Rückgriff auf Interviews, Archivmaterial und Zeugenaussagen von Charakteren erzählt, die in einem Exposé vorgestellt werden. Eine Off-Stimme skizziert das Szenario einer verstörenden Zukunft, in der sich die Mythen und Verheißungen des heutigen technischen Fortschritts übererfüllt haben. Shaw manipuliert die Erwartungen an Narration und Visualität derart, dass man in einen Zustand des zeitweiligen Aussetzens von Glaube und Zweifel versetzt wird. Die futuristische Biotechnologie und die Spiritualität und Transzendenz produzierendenVirtual Reality-Geräte, die in der Geschichte beschrieben werden, stehen in einem krassen Gegensatz zu Puzzlespielen und Tanzvideos, die auf einem alten Röhrenfernseher geschaut werden – es sei denn, man erkennt an, dass das Klassenproblem nicht durch den technologischen Fortschritt gelöst wird. Mit dem Stil und der Ästhetik eines Historienfilms, verstärkt durch die vertraute Körnigkeit und die Bildstörungen einer VHS-Kassette, kann die Arbeit für manchen Betrachter Nostalgie für die 1990er Jahre auslösen, das Jahrzehnt, in dem die Globalisierung den privaten und öffentlichen Sektor heimlich und radikal transformierte. Der Verwendung unzeitgemäßer Medien, um Nostalgie auszulösen, unterstreicht die Tatsache, dass der Glaube selbst eine Zeitlichkeit in sich trägt. Wirkt aufgrund einer anhaltenden historischen Verzerrung, die Faktizität historischer Dokumente im Vergleich zu denen, die mit zeitgemäßen Mitteln erstellt wurden, naiv? Während der Betrachter versucht, das Material einzuordnen, konfrontiert ihn der Film mit einer bedrohlichen Situation: Was wäre, wenn wir, die Bürger des 21. Jahrhunderts, unsere Spiritualität verloren hätten? Wie wüssten wir davon, und wäre sie für immer verloren? Was wären Fakten wert, wenn ein übergeordneter Sinn verloren ginge? Das Eingangszitat von Dr. Daniel Moore zeigt, wie das Kantsche Erhabene heute funktioniert: Es reicht nicht mehr aus, die Geheimnisse der Natur durch menschliche Augen wahrnehmen und verstehen zu wollen. Das menschliche Wissen ist längst von Maschinen abhängig, die die Welt für uns wahrnehmen und Zeichen produzieren, die wiederum von Wissenschaftlern interpretiert werden. Was aber wenn wir täglich erlebten, wie die menschliche Wahrnehmung auf das Universum hin erweitert würde? Was wenn wir an den Grenzen unserer Wahrnehmung nicht kehrt machen müssten? Verlören wir die Intimität, die uns immer dann befällt, wenn wir nicht abschließend erklären können, mit was wir es zu tun haben? Verlören wir unsere Demut? Unsere Empathie? Unseren Sinn für ein Außen und für eine Zugehörigkeit? Wenn Geschichte in der Gegenwart erzählt wird, dann überragt die Gegenwart der Filme Jeremy Shaws beide Seiten des umkämpften Moments, in dem wir leben. In einer mit Spannung erwarteten längeren Tanzszene in Dales Studio wird die Sehnsucht nach einem körperlichen Ausdruck überwältigend schön. Die Räumlichkeit des Sounds entwickelt sich langsam von Stereo hin zu Surround, begleitet von einer immer schneller werdenden Bildmontage. Wie es oft der Fall ist, entpuppt sich die Übungseinheit als eine der besten Performances überhaupt und erscheint wie der Höhepunkt des Films. Der Betrachter wird für einen Moment gewissermaßen klanglich verschlungen, bis Dale sich auf einmal in überwältigende computergenerierte Effekte aufzulösen scheint – die Shaw entwickelt hat, um eine extreme, subjektive Erfahrung zu veranschaulichen. In dem Moment, in dem der Protagonist den Tanz transzendiert, wird er zum Objekt filmischer Forschung. Die Transzendenz durch den Tanz verändert seinen Charakter und wird zum Kampf gegen die Darstellbarkeit. Dieser zweite Höhepunkt des Films ist ein zerstörerischer, er stößt die gesamte Ästhetik, Kontextualisierung und Narration um und läutet eine Transformation ein. Schlussendlich rahmt das Kunstwerk Dales Lebensgeschichte neu (und warum nicht auch die der Betrachtenden? ), indem es sein Dasein auffrisst und es in seinen eigenen Apparat inkorporiert. Dieser Bruch und dieses Einverleiben bleiben hochgradig ambivalent, können sie für einige Glauben, Glück und Frieden und für andere Wahn, Leid und Tyrannei bedeuten. Ist all dies nur business as usual? In seiner gesamten künstlerischen Praxis zeigt sich Shaw immer als scharfer Beobachter kultureller Phänomene, die die Normativität der Mainstreamkultur durch einen experimentellen Zugang zu Körper und Geist herausfordern. Seine Arbeiten erzeugen eine dramatische Spannung um Wahrheitsansprüche oder körperliche Transzendenz, die mit selbst-gebildeten Formen von Gemeinschaften verwoben sind, wie Kulten, religiösen Gruppen, Wissenschaftsgemeinden, utopischen Drogenszenen oder Musik- und Tanzsubkulturen. Diese Spannung – für manchen Betrachter vielleicht sogar Angst – erstreckt sich auch auf die Erwartungen an die Macht oder auch Effektivität der zeitgenössischen Kunst selbst. Die Realität ist eine Verschränkung von Effekten, die durch menschlichen Erfindungsreichtum entstehen konnten, die aber gleichzeitig das Risiko bergen, die Menschlichkeit zu verlieren. Wie in seinen vorherigen Arbeiten skizziert I Can See Forever eine Politik der Erschaffung und Ökonomie von Effekten und Affekten, Realitäten und Emotionen, die Fragestellungen rund um Identität, Glaubenssystemen, menschlicher Evolution und veränderten Bewusstseinszuständen aufwerfen, die einhergehen mit Einschränkungen, die uns das Menschsein auferlegt. Genauer gesagt, artikuliert der Film authentische Erfahrung, als Moment, in dem die Katharsis, die erhabene Erfahrung und ihre Repräsentation in einen ethischen und politischen Kampf um Autonomie geraten, dem wir uns entweder gewaltsam ausgesetzt fühlen oder als Fluchtversprechen wahrnehmen. In ästhetischer und konzeptioneller Hinsicht ist dies keineswegs die gemeinhin geschmackvolle Höflichkeit der bürgerlichen Kultur, wie sie in der zeitgenössischen Kunst vorherrschend ist. Was auf dem Spiel steht, ist ein Gefühl der Zugehörigkeit in der Komplexität menschlicher Sinnzuweisungen. Es ist bezeichnend, dass Dale durch seinen erweiterten Körper seinen eigenen Sinn für Zugehörigkeit entwickelt, indem er aktiv Prozesse der Forschung und des Experimentierens durchläuft – die Betrachtenden der Arbeit werden so angeregt, über ihre eigenen Überzeugungen und Praktiken nachzudenken. Durch die Aufhebung von Glaube und Zweifel gelingt es Shaws Arbeit, den Kampf zwischen der Suche nach Wahrheit und dem Verlangen, seine eigene Lebensform durch Selbstbestimmtheit und Ausdruck zu formen und darzustellen, entgegen dominierenden Formen der Herrschaft und der Meinungsbildung. I Can See Forever stellt die Frage: Ist die zeitgenössische Kunst ein geeigneter Ort, um einen solchen Kampf zu auszuführen oder eine solche Offenbarung zu präsentieren? Jeremy Shaw (* 1977 in Vancouver) setzt sich in verschiedenen Medien mit veränderten Bewusstseinszuständen und den kulturellen und wissenschaftlichen Praktiken auseinander, die transzendentale Erfahrungen verstehbar machen wollen. 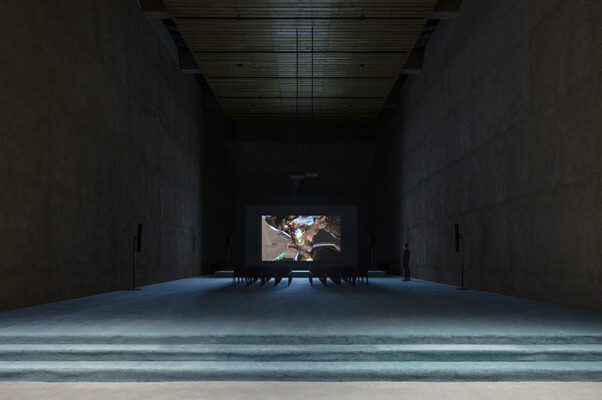 Seine Filme, Skulpturen und Installationen wurden in zahlreichen Institutionen weltweit ausgestellt, unter anderem in Einzelausstellungen im MoMA PS1 (US), Schinkel Pavillon (DE) und MOCA (CA) und in Gruppenausstellungen wie der 57igsten Venedig Biennale (IT), Manifesta 11 (CH), dem Stedelijk Museum (NL), sowie dem Palais de Tokyo (FR). Im Jahr 2018 nahm er am Residency Programm des Hammer Museums (US) teil und gewann in 2016 den Sobey Art Award (CA). Arbeiten von Shaw befinden sich in öffentlichen Sammlungen in aller Welt, etwa im Museum of Modern Art, NY (US), Centre Pompidou (FR) und Tate Modern (UK). In 2020 werden seine Werke in einer Einzelausstellung im Centre Pompidou zu sehen sein. I Can See Forever wurde koproduziert von Medienboard Berlin Brandenburg und KÖNIG GALERIE mit der Unterstützung vom Hammer Museum, Los Angeles, dem Kunstverein Hamburg sowie der Esker Foundation, Calgary.